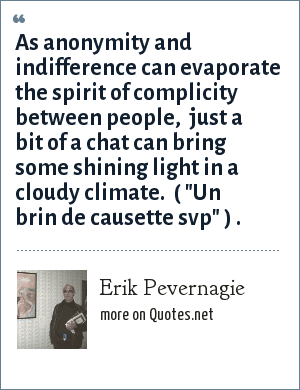 Erik Pevernagie: As anonymity and indifference can evaporate the spirit of complicity between people, just a bit of a chat can bring some shining light in a cloudy climate. ( "Un brin de causette svp" ) . "Erik Pevernagie Quotes." Quotes.net. STANDS4 LLC, 2019. Web. 23 Apr. 2019. <https://www.quotes.net/quote/63865>.